Our currently lifestyle includes hunching over a computer, sitting in long commutes or staring at our phones for hours So it’s not a big shock that neck pain is the second most common condition that we see in our office. We consider ourselves San Diego neck pain experts. 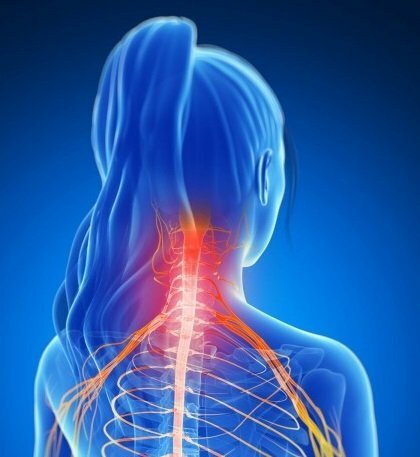 Neck pain can be caused by soft tissue problems such as muscles, tendons, and nerves, as well as bony and joint changes of the spine. Chiropractors treat both soft tissue and bony damage. The longer the problem stands, the more likely it will involve pain in the upper back, shoulders, and arms. Shooting pain that travels down the arm into the hand and fingers can be a symptom of a “pinched nerve.” This can cause symptoms of arm weakness, numbness, and pain. Although degenerative or traumatic disc damage are rare, they can also cause nerve entrapment. This is why it’s important to get checked out early. The body is constantly rebuilding itself. Overuse is a mechanical irritation from repetitive movements causing strain injuries. Repetitive movements such as computer use can cause damage to soft tissues such as tendons, muscles, ligaments and nerves. The muscles in the back of the neck get stretched, and the muscles in the front of the neck get shorter. If symptoms are chronic, recurring, or persistent make sure to get checked out right away to avoid further damage. We can also give you advice on how to make ergonomic changes for your home or work station. A trauma, such as whiplash, can jar the head and neck forward, backwards, and even sideways. These types of injuries are common in car accidents, but can also be caused by a sports injury or work injury. Even a ride on a roller coaster can set things off symptomatically. The soft tissues of the neck are stretched beyond their normal range of motion causing microtears and eventually scarring. Osteoarthritis is best known as wear and tear, or joint degeneration. This type of damage happens over time as stress or injuries accumulate. It is common to have reduced flexibility and increased stiffness in our spine, especially in our neck. However, this does not make it normal. Although we can’t necessarily go back in time, we can definitely stop or decrease the amount of joint damage moving forward. Posture affects function. Poor posture is 100% due to body imbalance, causing uneven muscle balance throughout the body. Have you ever stopped to think why only your right shoulder hurts? Or your left knee? Body balance starts in the upper neck, as we try to balance the weight of our head over our neck and shoulders, and the rest of our body twists and compensates in the process when we are out of alignment. After all, our head weighs as much as a bowling ball! Yeap, 10-15 pounds. And delicate, neurological structures live inside of your neck. Microtraumas, such as repeated slouching affects your posture over time as well. Neck pain is no joke. We urge everyone to get help sooner versus later. Know someone that could use our help? Pass it on…they’ll thank you for it!